Ownership of all goods supplied remains vested in TechnoPro until payment is made in full. We only sell products imported by the official importer of the relevant brand, hence all our products carry their full manufacturers warranty. Unless stated otherwise, we cannot honour a product warranty if the product has been physically damaged, struck by lightening, installed incorrectly or subjected to misuse or abuse in any way. When a customer selects and pays for goods, the parties agree that this is an offer to purchase from TechnoPro - Optics Online. TechnoPro - Optics Online then, at its sole discretion and even if payment has already been effected, choose to accept or reject that offer. On rejection of an offer where payment was already made, TechnoPro - Optics Online will issue the customer with a full refund within 7 days from date of cancellation/rejection of offer. All orders are usually shipped within 3-5 days from confirmation of order, subject to availability of stock and receipt of payment. Orders placed over weekends or public holidays will be processed on the next working day. Once the order is shipped you will receive an e-mail confirming shipment including any tracking information if applicable. All items purchased from TechnoPro are made pursuant to agreements with shipping and delivery agents and risk of loss pass from TechnoPro to such agents upon delivery of any item to such carrier. Speedservices "counter-to-counter" deliveries are normally used to send our items. We may use different couriers depending on the weight, size and destination of the order. TechnoPro shall not be liable for any loss of profits or any damage, direct or indirect, consequential or otherwise sustained by the purchaser whether or not caused by the negligence of the seller, its agents or employees. Faulty equipment is to be returned to TechnoPro offices in Randburg only. See our returns policy below for more details. Your satisfaction is our top priority. We guarantee the quality of our products and we want you to be completely satisfied with your purchases. If for any reason you are not completely satisfied with your purchase, we will be happy to exchange the item for you to better meet your needs and tastes. You can return the purchased items within 7 days of receipt for an exchange (less shipping charges) subject to Return Conditions. Used or damaged items and returns with promotional items missing will not be accepted. To help us continue being a Best Value Provider, please be sure to include all the free and promotional items, as well as all applicable accessories and literature, received with the original order in case of a return. Generally, as a "rule-of-thumb" you return the items to us the same way we sent them to you - in the same condition and with all the original contents. If a promotional item is missing, its value will be added to the original price you paid for the order, thus reducing the amount available to be used for an exchange or store credit, if such is issued. We do not accept returns on customised orders. Please see Return Policy Exceptions (below) for more information on non-returnable items. All charges related to the return of items to TechnoPro - Optics Online are the responsibility of the customer. There is no restocking fee for returns of unopened, unused, and untested items returned within 7 days. Please keep in mind that restrictions apply (see Return Policy Exceptions for more details.) A restocking fee of 20% will be applied to returns of opened, used, or damaged products to cover our processing, packing, shipping expenses and credit card fees. Additional fees may apply if the item is not returned in its original packaging. We reserve the right to charge a restocking fee of up to 25% for the return of resalable items outside of the policy stated here. High-value items of R1,000 and up will be subject to a restocking fee. If an item comes damaged as a result of shipping, we will be happy to exchange it for you. An insurance claim has to be filed and finalised before compensation is issued to the customer or product is replaced. Please contact us within 3 business days of delivery to initiate a claim. A damaged item returned for a replacement may be repaired or exchanged at TechnoPro - Optics Online's discretion. Shipping charges on returns are not refundable. We do not offer refunds for shipping charges, including but not limited to domestic Ground, Express or International shipping. Please be advised that we are unable to refund any fees imposed by an entity other than TechnoPro - Optics Online, such as customs or brokerage fees. Being a Best Value Provider, we have created a hassle-free Return and Exchange process with step-by-step guidelines for your convenience. The process is simple providing you follow the instructions. Once your RMA request is submitted, you will recieve an E-Mail with Return Instructions and Merchandise Return Label which contains an RMA number that is valid for 5 business days. Pack the unit securely using original packing material. Please note that we do not accept COD shipments. Use a service with delivery notification. Using one of these shipping methods will make shipment tracking possible. Please insure the package for full value of the merchandise. The merchandise is still your property until it reaches our warehouse and we are not responsible for any shipping damages occurring at this point. Please note that we are not responsible for lost or stolen returned merchandise. All returns are processed within 1-3 weeks of the receipt of returned merchandise. Refunds, when applicable, are issued within 2 weeks of processing the return as credit card companies vary in their processes of posting credits back to your account. Items that require mounting and assembly, such as riflescopes or telescopes, that have been mounted and/or assembled. Customised or personalised products including but not limited to prescription eyewear and custom-made riflescopes. 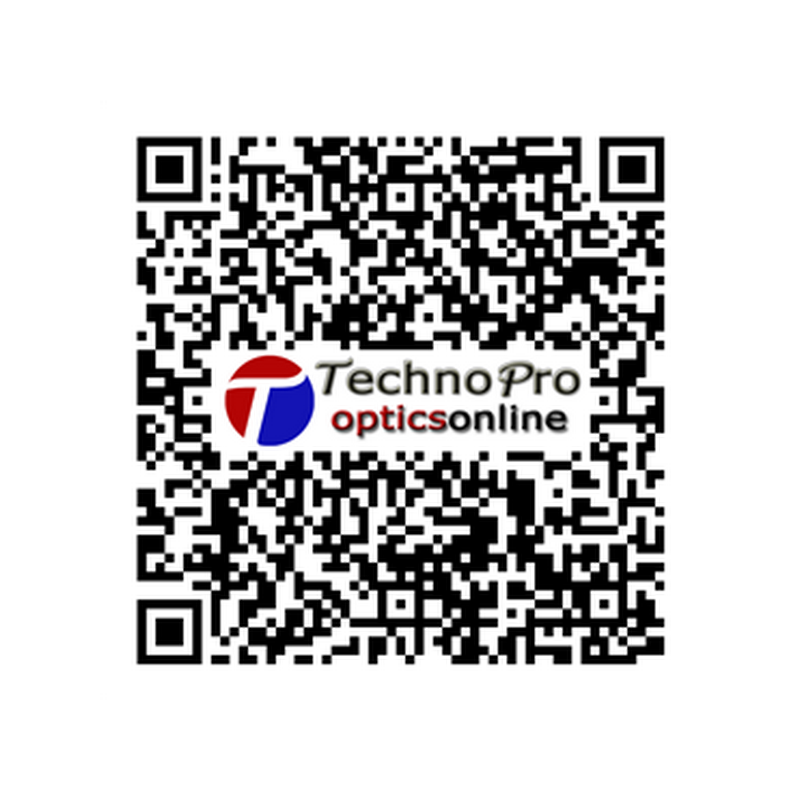 TechnoPro - Optics Online gift certificates. Electronic products including but not limited to GPS, Telescopes, Range Finders, Night Vision and thermal imaging. Items that have been removed from blister packaging, such as batteries, memory cards. High-value items of R1,000 and up. If you receive damaged merchandise or do not receive it at all, the carrier will need to conduct an investigation. Please notify us immediately about the problem within 3 business days of receipt. DO NOT discard the shipping carton and manufacturer's packaging to facilitate the investigation process if necessary. All claims are usually processed within 2 weeks from the time of initiation. If the carrier claims responsibility for the lost or damaged item, insurance reimbursement will be issued to TechnoPro - Optics Online. In return, a replacement item will be sent to you.